Ultimate Masters has made a big splash in the collective consciousness of us Magic players with its fantastic suite of reprints. It features brand new art for the much-beloved (or much-maligned) Sultai Shaman, Tasigur, the Golden Fang. Infamous as a piece of dazzling neckwear for Dragonlord Silumgar, this sly, impetuous character uses the Delve mechanic to astonishing effect, reducing his own cost more than Karador, Ghost Chieftain and retrieving so many cards from the graveyard that it makes Eternal Witness jealous. Of course, Dominaria brought with it another grave-tastic commander. She’s the child of Multani and the most popular commander from her set: Muldrotha, the Gravetide. As a longtime fan of The Mimeoplasm, I’m normally very territorial about Sultai commanders that interact with the graveyard. Still, I guess I can’t be too upset that these commanders are so popular, because it means the rest of the world gets to enjoy that awesome graveyard journey with me. How do these two Sultai death-manders compare? Let’s plunder the graves on this week’s Commander Showdown! We’ll begin with the Delve master extraordinaire, Tasigur, the Golden Fang. As a 4/5, he boasts some respectable stats, particularly when you realize that he only costs one mana. Loading up graveyards is easily doable for us Sultai folks, and sifting away all your unnecessary lands and such for a cheap commander is A+ value. Speaking of value, that activated ability an help fuel our graveyard even more, and retrieve a card to boot! It’s like a mini Corpse Churn, but it has a broader range of targets. That said, one of our opponents gets the final say in what we recollect. There are a lot of implications tied to that choice, but we’ll get to them in a moment. For now, what is ol’ Tasigur up to? A quick glance at his EDHREC page shows us a lot of answers. No, literally. Tasigur’s page is filled to the brim with ‘answer’ cards: Cyclonic Rift, Beast Within, Sultai Charm, Counterspell, Disallow, Swan Song, Putrefy, Assassin’s Trophy, it just goes on and on! Interspersed among all those problem-solving spells are classic card advantage providers, from Dig Through Time to Fact or Fiction. This should be no surprise. Ol’ Tassy can recall spells from the graveyard, which means a single removal spell can potentially be cast a half-dozen times in one game. When each of your spells has repeated Flashback, it’s just a matter of outpacing your opposition. Whenever they cast a threatening spell, you can one-for-one them, then get your spell back, resulting in a net gain for you and a loss for your opponent. This is also why we don’t see many ‘threats’ on Tasigur’s page. Tasigur isn’t brimming with big baddies like Grave Titan or Terastodon, because he doesn’t need to. Classic control decks don’t need to load their decks with victory conditions. All they have to do is stay alive and establish control. This allows them to leave the majority of the deck open for valuable removal spells, so they can patiently dig down to their win condition after locking down their enemies. I normally like to do a Venn Diagram segment when comparing two commanders with the same colors – in this case, comparing Tasigur’s Top and Signature Cards to Muldrotha’s Top and Signature Cards – to see what cards overlap. However, in this case, Tasigur has almost no Signature Cards to provide! The only Signature Cards on his page are Dig Through Time and Reality Shift. 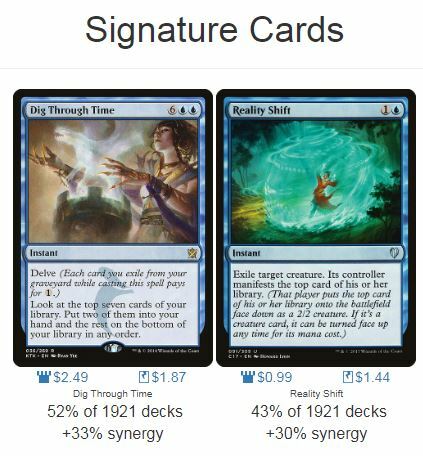 Signature Cards are more unique to a commander’s specific strategy, and since Tasigur runs so many classic Sultai removal spells (sometimes criticized as ‘goodstuff’ cards), it makes him appear less unique than some of the others. I elected not to include other Delve spells like Dig Through Time and Treasure Cruise. They’re highly popular on Tasigur’s page, but I personally think they get in the way. Anyone who played Khans of Tarkir Limited knows that Delve spells do not cooperate very well with other Delve spells. If Tasigur leaves the field, I’d like to be sure I have an ample graveyard so I can recast him for cheap, leaving up the bulk of my mana for my many instant-speed spells. This is the type of deck where the infamous Vedalken Orrery is more or less obsolete; the deck is already so full of instants that the Orrery is completely redundant. As mentioned above, the deck has tons of removal spells, lots of countermagic, and plenty of control elements, but few of the classic Sultai win conditions. Why? Because Tasigur, the Golden Fang is a win condition unto himself. With infinite mana, a lot of things are possible in EDH. Teferi, Temporal Archmage and The Chain Veil can take you to the moon and back. Breya, Etherium Shaper can continually cast and sacrifice herself for a bazillion damage. And Tasigur? He can draw your entire library. Read carefully; you don’t need to have cards in your library for Tasigur to mill to activate him. If you happen upon an infinite mana combo, Tasigur can mill the entirety of your library, then return every nonland card in it to your hand. With all those answer cards as backup, he can guarantee a successful Torment of Hailfire, or else just retrieve it from the graveyard if it fails, then try again. He doesn’t need to waste valuable slots on a multitude of victory conditions. It only takes one, because he’ll make sure he draws it anyway. Until then, he keeps himself protected with more removal and countermagic than you can shake a stick at. Better yet? Tasigur can actually turn his removal spells into win conditions. Yeah, it’s gross. And it’s awesome. Reality Shift is a truly underplayed removal spell that permanently removes your opponent’s favorite creature in exchange for a 2/2 that they Manifest from the top of their library. We’ve seen cards like this plenty of times before, like Pongify and Beast Within, which give your opponent a very small reparation for the valuable permanent they just lost. However, Reality Shift is much more devious than the others. Why? Because it supplies your opponent with a creature by using the top card of their library. From one perspective, this is a simple removal spell, but from another perspective, it’s a spell that mills your opponent for a single card. That’s what makes Tasigur so deadly. His deck is chock full of removal, because at any moment a single combo will put every spell from his deck into his graveyard and then into his hand, where he can utterly demolish the rest of the board. It’s hard not to get as smug and satisfied as Tasigur himself when your removal spells overlap as your win conditions too. That’s value we should all be able to get behind. We’ll get to a few other neat Tasigur goodies in a bit, but for now, we have a Gravetide to wade through. Muldrotha, the Gravetide made quite a splash in Dominaria. Just like Tasigur, this 6/6 Elemental Avatar can retrieve things from our graveyard. In this case, however, we don’t have to return them to our hand. Instead, we can cast them straight from the graveyard. Like Crucible of Worlds and Gisa and Geralf before her, Muldrotha allows us to play permanents from the graveyard as though they were in our hand. Once on each of our turns, we can play up to one card of each permanent type: one land, one creature, one artifact, one enchantment, and one planeswalker. To be clear – because I still see this mistake happen – if you have a Muldrotha and a Ramunap Excavator in play, you don’t get to play two lands from your graveyard. Regular rules still apply. Additionally, bear in mind that ‘tribal,’ as seen on Eldrazi Conscription, is not a permanent type. It is a card type, for the purposes of Tarmogoyf and such, but it’s not specifically a permanent type, so Muldrotha can’t revive them separately. However, she graciously will allow you to cast a Solemn Simulacrum as your artifact for the turn and a Wood Elves as your creature for the turn, so that’s pretty awesome. This factor alone makes Muldrotha quite unique from Tasigur. Tasigur can retrieve anything he likes (or rather, anything an opponent likes) out of the graveyard, but Muldrotha is retricted to permanents; no instants or sorceries. This might be frustrating for some, since you can’t Cyclonic Rift every turn (thank goodness) but on the other hand, you don’t have Tasigur’s four-mana gamble tax whenever you want to reclaim a dead card. Besides, there are plenty of ways to make sure you get spells back, too! Eternal Witness is ever famous, and even Archaeomancer can put in a good show. The duty for Muldrotha is thus to spread out her value as much as possible. We don’t need to have 18 creatures in our graveyard; while the versatility that offers is great, we can only revive one of them at a time. What we need is a smattering of permanent types, so we can revive multiple cards per turn. To maintain that much-desired versatility, we can therefore make sure our permanents overlap as much as possible. Purveyors of Meren of Clan Nel Toth know Caustic Caterpillar well, but do they know Sylvok Replica? You could play the traditional Reclamation Sage, but you could also play a repeatable artifact with its own built-in sacrifice outlet, allowing you to recast it again, and which won’t use up your creature slot for the turn. Similarly, Baleful Strix is a very pesky defensive option, and its extra flexibility in this deck shouldn’t be underrated. There’s another very important aspect to mention about Muldrotha, but it’s best explained with a full 99, so let’s check out a decklist. Anyone who’s played against Muldrotha knows that she’s annoyingly stubborn. Every time you destroy one of her threats with a Mortify or a Krosan Grip, she just brings it right back. If anything, she’s similar to Avacyn, Angel of Hope, ensuring that your permanents are indeed permanent. Muldrotha is a never-ending value train. 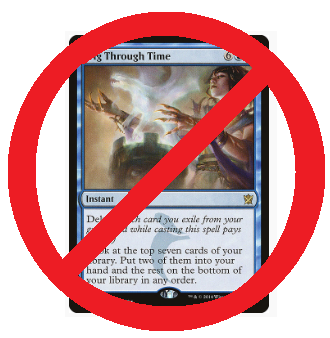 However, there’s a hard lesson to learn here, one that my fellow cohost Matt Morgan of the EDHRECast has wisely preached for quite some time: value trains, while effective, can also be sinfully slow. Muldrotha decks can indeed spend the entire game Mulldriftering and Seal of Primordiuming, but you need a way to clinch victory once and for all. It’s an easy trap for players to accidentally get so distracted by a value engine that they miss the opportunity to actually win. A good analogue is Brago, King Eternal. Every creature buries your enemies in card advantage, but Reflector Mage and friends are a very slow win condition. As a result, many Brago players turned to combos like Deadeye Navigator and Palinchron or Strionic Resonator combos to end the game in quick fashion, rather than letting it drag out for nine hours as they inch toward the finish line. While I’m not a combo player myself, I do think that Muldrotha could take a leaf out of this book. There are so many combos with permanents that Muldrotha can pull right out of the graveyard. Presence of Gond + Intruder Alarm, for example. Or you can make sure an alternate win condition card like Revel in Riches never stays off the field for long, constantly forcing your opponents to sweat. You can even take a hint from Meren of Clan Nel Toth and repeatedly play and sacrifice Kokusho, the Evening Star, or perhaps even toss a Lord of Extinction to Jarad, Golgari Lich Lord. Long story short, don’t let the pursuit of “value” artificially restrict you from winning. There are some Magic players out there who, when confronted with a spell that says, “Choose one – Win the game; or draw five cards,” would choose to draw the five cards. Value for value’s sake isn’t actually valuable. Go get that win. Let’s wrap up with some cards that warrant extra consideration for both of these commanders. Notion Thief: Because it’s mean and gross and very effective. Training Grounds: This only shows up at 32% popularity as a result of its price, not its effectiveness. If you have one, play it here. Seedborn Muse: This is one of the most obnoxious cards in the format, and Tasigur can make very good use of it. Regrowth: This shows up in 35% of Tasigur decks, but I feel like it should be higher. Eternal Witness is in 65% of decks. Tasigur can return any card, and doesn’t specifically return creatures more often than other card types, like Meren of Clan Nel Toth. To that end, this is a useful copy to include. Nature’s Claim: If you’re winning with a combo, enemy life totals don’t matter. Low mana costs do. Perpetual Timepiece: If Sultai Ascendancy can show up in 41% of Muldrotha decks, this cheaper card that card also save your graveyard from a Bojuka Bog should show up in more than 28% of decks. Necromancy: Same as the above; if Animate Dead is at 51%, this incredibly similar enchantment should be way more popular than 17%. Archaeomancer: I’m still not done! Eternal Witness shows up in 60% of Muldrotha lists! 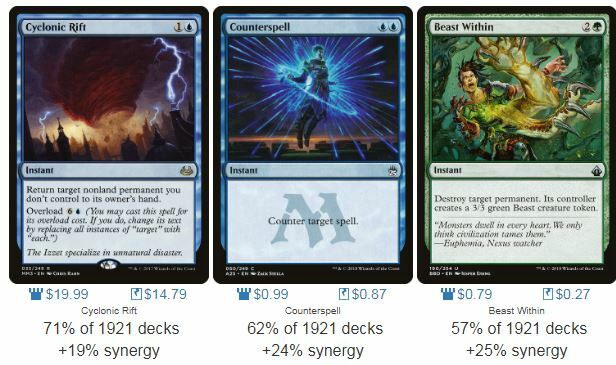 Your commander already gets you the permanents you need, which means Witness is largely relegated to retrieving spells. Archaeomancer also retrieves spells, and yet it only shows up at 21% popularity. River Kelpie: Will give you so many cards it’ll give you a stomachache. Night Incarnate: Since you have several Plaguecrafter effects to force opponents to sacrifice creatures, your main problem will be dealing with tiny tokens. Incarnate is a repeatable board wipe that keeps your commander alive and clears the board so you can Plaguecrafter your opponents big baddies successfully. 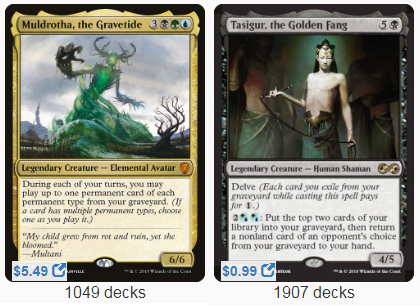 In truth, comparing Tasigur, the Golden Fang to Muldrotha, the Gravetide is disingenuous. Sure, at first glance, they’re both Sultai recursion commanders, but in spirit, they’re entirely separate animals. Tasigur is far more similar to Thrasios, Triton Hero in intention, controlling the board until an infinite mana combo puts your entire deck into your hand. Muldrotha, meanwhile, is similar to the aforementioned Brago, King Eternal, or perhaps Roon of the Hidden Realm, grinding out persistent value at a steady pace, but probably needing a swift kick in the pants to make sure they actually get around to winning properly. So, which commander would you build? Do you like Tasigur’s wicked schemes, or has his banana-less new art driven you to into the glowing green arms of Muldrotha? Let me know in the comments below! Oh, and don’t forget to vote for the pair you’d like to see on the next Commander Showdown! Kemba, Kha Regent vs Sram, Senior Edificer vs Nahiri, the Lithomancer vs Balan, Wandering Knight – The ultimate Equipment Battle Royale! Niv-Mizzet, Parun vs Niv-Mizzet, the Firemind – Which Niv is the best Mizzet? 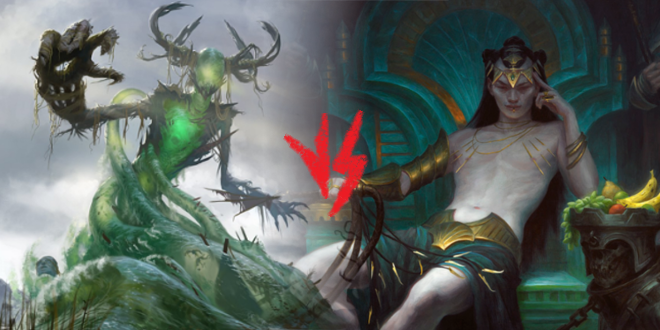 Kruphix, God of Horizons vs Omnath, Locus of Mana – Who can hold the most mana?